Sorry for the delay this morning! 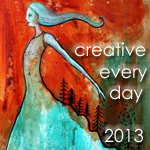 This weekly check-in post is a place for Creative Every Day Challenge participants to share their creative activities. Ways to share: Once you've signed up, you can leave a comment on this post and/or use the "Mr. Linky" widget below to link to a blog post(s) about your creative activities during the days of 4/22/13 - 4/28/13. Theme: April's totally optional theme is Color, which you read more about here. I was late today too, even so it´s one of the few times I could get in within the first ten. Thanks for giving us the connecting chance Leah! I´ve met many cool artists and also made a few friends through you. I was concerned you weren’t well! Thanks for the update post.=) I’ve had to skip two recently as I hadn’t blogged anything, but I’ve kept more or less up to date with the challenge. Thanks for this blog. I just joined in on the 2013 challenge. I’ve been very creative the last couple of weeks and keep meaning to post to share my excitement. Ah I’m sooo happy I was able to squeeze in a submission for this month. Turns out your challenges are the only “fun” I’m able to fit in to this crazy schedule right now. Thanks so much Leah~ loved this months’ theme! Just found your lovely site. Thank you. So much to look at !